After two and a half years of development, people are finally playing Infliction! No, it isn’t the full game yet – that will be coming in October for your Halloween gaming goodness – but instead they are playing the demo that I released on Steam to coincide with the launch of the Kickstarter. What’s been especially enjoyable has been the flood of “let’s play” videos on YouTube. Just two weeks after release, these videos had topped two million total views, and they keep on climbing. The overwhelmingly positive response to the demo, and to people watching the demo being played by their favorite YouTubers, has given me a huge morale boost. It’s hard working on a game for years as a solo developer, never 100% sure you’re making the right choices, so I’m feeling pretty good right now. Watching all of these YouTubers play the demo has also given me an injection of fresh new ideas. 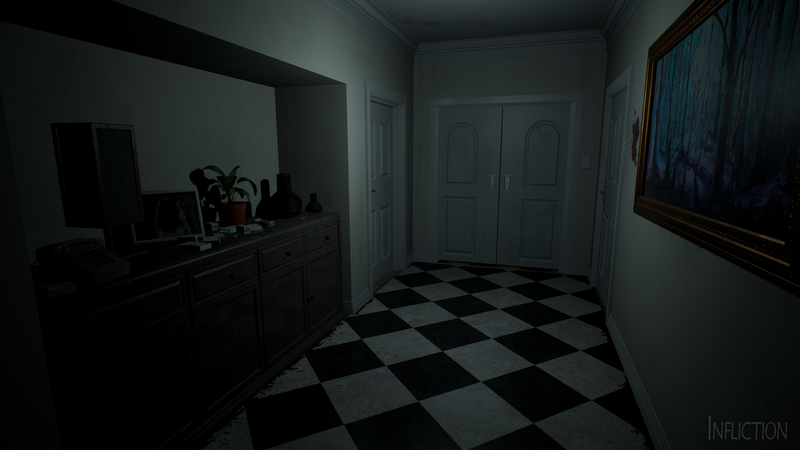 A lot of the time, the parts that really creeped them out were the tension building moments rather than the big scares, which is exactly what I was going for. I can watch these videos, study their reactions, and use that to tweak the final game further. It’s about 95% complete, with mostly polishing being needed between now and Halloween, but I can make little changes and feel confident it will be worth the effort. We’re into the final week of the Kickstarter, and we’re going to need one last big push to get over the line. It isn’t a big goal, just enough for me to hire an animator and give the finished game a bit of extra love, but it will definitely mean a more polished game if we can get there. I’ve done everything on this game myself, and while my animation is fine, a real pro will take it to a whole new level. Check out the Kickstarter if you want to lend a hand, plus you can score some cool extras. Thanks to social media shares, every backer level is getting a creepy soundtrack, a universe-expanding short story, and (hopefully) an audio book. There are also some cool ways you can get a piece of yourself into the game. Thanks for checking out Infliction!